A family rides down JFK Boulevard Saturday afternoon in Center City. 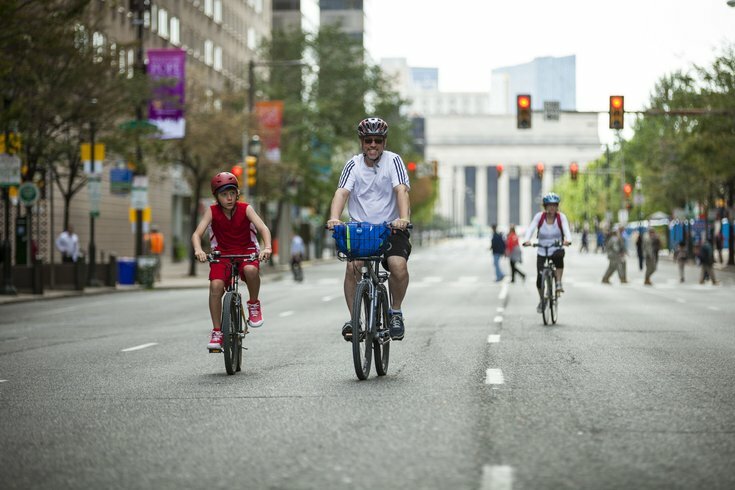 Philadelphia has maintained its silver status as a "Bicycle Friendly Community," a title given to the city by the League of American Bicyclists. The League of American Bicyclists, a national organization that looks to promote cycling across the United States, awarded 103 communities Wednesday. Of the 103 communities, there were 26 new recognitions and 77 renewals. Communities awarded the status had to meet certain criteria, including safe accommodation for cyclists as well as efforts to encourage biking. Philadelphia was designated silver status for the fall 2016 round of awards. The city also received silver in 2012 and bronze in 2009. The award status lasts for four years, according to the League of American Bicyclists. The nonprofit said that to get to gold, Philadelphia needs to improve bike parking and enforcement-related efforts, strengthen its "Complete Streets" policy and dedicate more staff time on improving conditions, among a few other recommendations. This year's 140 applicants were the largest in the program's 13-year history, according to the organization. In total, there are 404 "Bicycle Friendly Communities" across the country. Philadelphia joins 74 other "silver" communities, including Chicago and New York, in 2016. Twenty-six communities, including San Francisco and Seattle, were given "gold" status. Five, including Portland and Davis, California, received "platinum" recognition. "It is clear that communities of all kinds in every corner of the country know that making bicycling a real option for transportation and recreation is vital in building vibrant, connected communities," Bill Nesper, vice president, programs, of the League of American Bicyclists, said in a statement.